“Roland PG-800 programmer for sale (for use with Roland JX-10, JX-8P AND MKS-70). Item has had only a couple of hours use in its entire life! Immaculate condition – mark, scratch and dust free. Has the patina of a brand new unit (which is basically what it is). “Roland JX8P Vintage Polyphonic Synthesiser Digitally controlled Analogue. Condition is Used. This is a uniqe collectors vintage Roland JX-8P originally owned by the 80s Rock Band “Bite the Bullet”. The synth comes with the memory card containing the sounds created by the band using the PG-800 controller, which is included in the sale and featured in their first album released in 1989. The PG-800 controller is an essential editing tool for the JX-8P and can also be used during live performance. A copy of the CD “Bite the Bullet” is also included in the sale. Don’t miss out on this unique and exiting opportunity to own one of the most iconic synthesizers of the 80s. It is in good working order and recently serviced. As with much loved vintage equipment, it shows many battle scars and these are shown in the photos. I personally think it adds to the kudos of this fantatic synth. 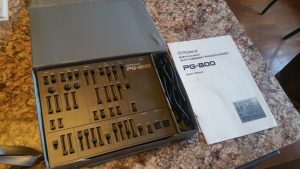 “Roland PG800 controller in excellent condition. Comes with Roland carrying case, cable and manual. I pack well and ship out quickly. “Uniqe collectors vintage Roland JX-8P originally owned by the 80s Rock Band “Bite the Bullet”. 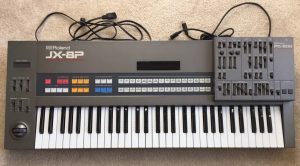 The synth comes with the memory card containing the sounds created by the band using the PG-800 prorammer, which is included in the sale and featured in their first album released in 1989. The PG-800 is an essential editing tool for the JX-8P and can also be used during live performance. It is in good working order and recently serviced. As with much loved vintage equipment, it shows some battle scars, a couple of the slider knobs are missing and these are shown in the photos. ” The synthesizer is in excellent physical and operational condition. Every control surface works as expected, there are no dead keys, and audio out to my test monitors is crisp and clean. The programming console is in excellent operational condition. All its sliders work and have their handles. All the knobs turn easily. I had a new internal battery installed ..
• The pg-800 really opens up synth !! Pg 800 has all original carry case and connection midi cable. I’ve shown this programmer a lot of love over the years. 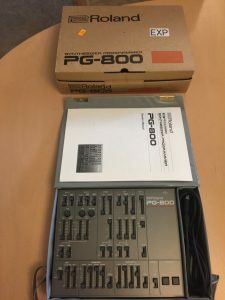 “Roland PG-800 in very good condition. “Super clean MKS-70 used in smoke free, climate controlled studio. This Roland synthesizer comes with the Roland PG-800 programmer. Also comes with 2 plastic placards that came with the manual. “Roland JX-8P Analog Synth with PG-800 Programmer’s Module. Vintage Unit. Unit is in great shape. No issues. Original owner. Well cared for. 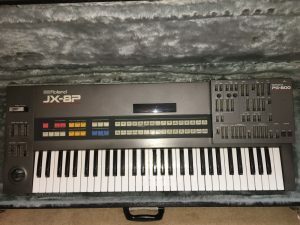 I’m the second owner of this JX-8P. It’s in really great condition although the bottom is scratched (but who looks at the bottom?!). The rare and hard to find PG-800 gives you the tactile experience that comes with external gear and really a necessity with the the JX-8P. You’ll be hard pressed to find one in such immaculate condition. There are two dead keys (G1 and A2) when triggering them directly off of the JX-8P (probably dirty contacts that can be fixed easily and cheaply) however, everything triggers via MIDI so it never was / never will be an issue. 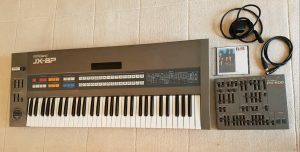 “Up for auction is a vintage Roland JX8P Analog Synthesizer plus the PG-800 Controller with the carry case. A quick test confirms that all audio outputs are working, all keys function, all the patch-preset buttons work, and the display is fully functional. The PG-800 is also in working condition. Please note that the previous owner was a smoker. Both the JX8P and PG-800 were surface cleaned, but still shows signs of a smoker’s environment. Everything works except the aftertouch. This is well used with a few scratches and scrapes. “This is needed for quick and easy editing of the JX-8p, MKS-70 and JX-10 synthesizers. It offers complete control of all parameters in an easy to use traditional slider controller. A must have since the synths alone employ a tedious system of editing. The underside has 2 strip strong magnets which keep the unit completely secure on the synth (see the pic of it attached to the JX-10 while it stands on end against the couch). “Awesome combo – Vintage Analog Roland MKS70 + PG800 + programmer cable and power cable! PG800 – works perfectly except the “write button” does not function. Button is not necessary because once you program a sound on the PG800 and want to save it, you just use the write button on the MKS70 instead. Perhaps your keyboard tech can fix it or replace with a functioning button. MKS70 – could use a cleaning (clean buttons/contacts). It works fine except some of the front keys double trigger when you press them or you have to press them firmly. I imagine this is a matter of cleaning the contacts or opening it and blowing some compressed air back there, but I’m not a technician. There are some marks on the synth, and rack ears show some bumps/bruises!